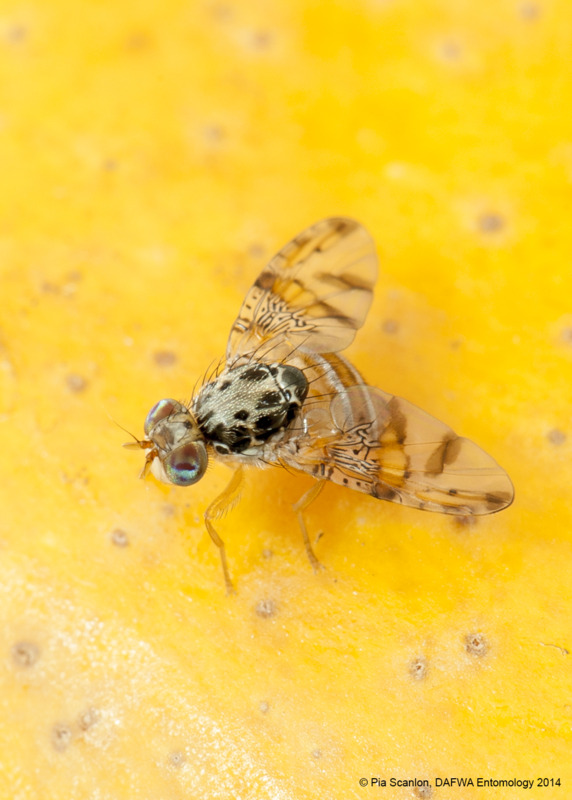 Mediterranean fruit fly (often known as Medfly) is a major problem for backyard and commercial orchardists. Cover sprays are applied as very fine droplets to the entire tree including the fruit, but should be considered only if fly numbers increase to unacceptable levels. Some growers may also apply a cover spray near harvest as final insurance against fruit fly damage, particularly to highly susceptible crops such as stone fruit. Cover sprays will not stop the female Medfly from stinging fruit and will kill beneficial organisms as well as pest insects. Cover sprays used to be the main weapon used by orchardists to prevent damage caused by Mediterranean fruit fly (Medfly) laying its eggs in their crops. Changing regulations have resulted in growers adopting more wholistic approaches to Medfly control, with cover sprays being but one tool in the armory. Bait spraying and orchard hygiene are now recommended as the cornerstone for fruit fly control for commercial orchardists as they suppress the entire fruit fly population. Most cover sprays only kill adult flies on contact, and the population will increase again in two to three weeks if no other control is carried out. Integrated pest management (IPM): Cover sprays are non-selective and kill all insects present in the orchard. For this reason they are incompatible with IPM, and secondary pest problems can occur. Growers need to consider this when planning their overall pest control strategy. Bees: Some insecticides are toxic to bees. Always consult the label before applying a product. Spray drift: Cover sprays may drift onto other fruit crops and particular care needs to be taken. Exporting: Check with your distributor before applying cover sprays, as regulations vary in different markets. Only apply a cover spray if sustained numbers of Medfly are being caught in traps. If applied prior to harvest, ensure that the withholding period is sufficient as it varies from 3 to 21 days depending on which insecticide is used. The whole tree, including the foliage and fruit, must be covered with insecticide to the point of run-off. The amount of insecticide used depends on the size of the tree — the larger the tree the more the insecticide required. The smaller the tree, the less is required. Spray applications should only be applied by trained personnel, using correctly calibrated equipment as per good agricultural practices. Take special care to minimise spray drift onto non-target crops. For more information on spray applications consult the Pome and Summerfruit Orchard Spray Guide or visit the Australian Pesticides and Veterinary Medicines Authority website. How old is the insecticide that you are using? Potency can decrease with time. Is the pH of the water right? Is the entire tree being treated? You may need to readjust your spray equipment to achieve this. To assist in controlling Medfly, several minor use permits have been issued by the Australian Pesticides and Veterinary Medicines Authority (APVMA) that allow the use of certain chemicals in a manner not currently listed on the registered label. Growers planning to use these chemicals as per the permit, must obtain and maintain a current copy of the permit. Copies of the permits are available from your chemical supply agent or the APVMA website. Insecticides used as cover sprays to control Medfly are available for a range of fruit and vegetable crops. Tables for several key crops of high susceptibility follow. Consult the APVMA website for information about available permits and registered insecticides for other crops. Please note that the pesticide fenthion is no longer allowed to be used. The cease use page on the APVMA website has more information.